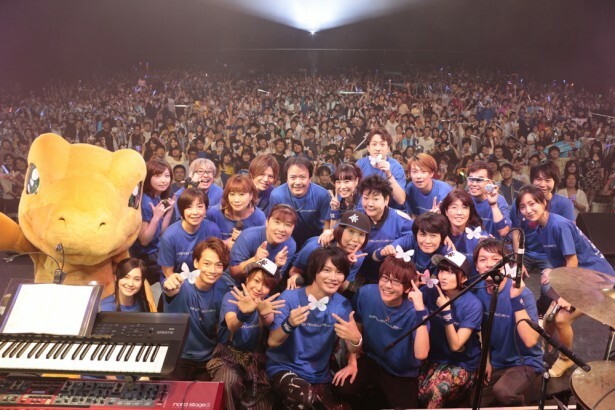 Digifes '15 group shot of the two generations of Digimon Adventure seiyuu, and the voices of their partners, c.Newtype. Born in 1986, Mimori "Mimorin" Suzuko was thirteen years old when Digimon Adventure first aired. The third oldest of tri. 's new cast, in 2015 she was revealed as the new voice of Takenouchi Sora, replacing Mizutani Yuuko. Unlike some of her coworkers, Mimori has been reserved about her experiences with Digimon, and it's unknown if she even saw Adventure during its original run. Mimori has been enthusiastic about attending events related to Digimon Adventure tri., appearing at its October prescreening in-character with Hanae Natsuki and Ichimichi Mao. Originally a stage actress, Mimori was first scouted as a seiyuu by Bushiroad CEO Kidani Takaaki. Mimori first began doing voice work in 2010, taking on her breakout roles as Sherlock Shellingford in Tantei Opera Milky Holmes, and in 2011 as Cardfight!! Vanguard's Tatsunagi Kourin. The Shellingford character--along with the other Milky Holmes cast--would continue to make cameos in Vanguard through 2013, but the mass exposure of working in a Sunday morning children's show versus a late night anime made Kourin one of her defining roles to the present day. Mimori would also make regular appearances as a TV host for the Vanga-road program, and later on Bushiroad's weekly Cardfight!! Vanguard livestream events, alongside Morishima Shuuta and Nakamoto "Doctor O" Nobuhisa. Digimon Adventure tri. will premier in Japan on November 21st, 2015.